My talented husband, you know him as Bob the chef, is also a musician. In fact, I think that is why I fell in love with him in the first place... Recently he was asked to join a band as their percussionist. As much as I like music, I was not looking forward to hauling around a trap set at our age. In the 80's Bob was in a couple of bands and we set up and tore down so many weekends! He plays a drum called a Cajon (pronounced Cuh hone) that he sits on and beats on it with his hands, fingers or a set of special brushes. He can set up and take apart his own instrument! Yippee!! They played to a crowd on Saturday at a new bar called The Mission in Jefferson City. It was standing room only and there was actually a line to get in to hear them! In fact, one set of friends got in only to hear the last song! 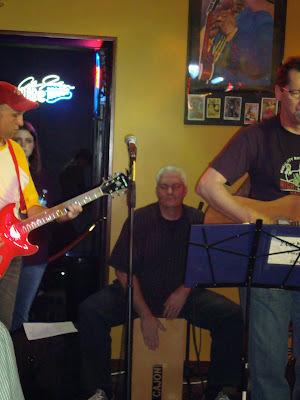 The band has a lead singer, a lead guitarist who also sings and plays harmonica, a bass guitarist who can also play lead guitar, a cellist, and now Bob, the percussionist. They play an eclectic style of music, some originals, some Beatles, Madonna and other people I don't really know! The bar manager told the band leader that this was his best night yet. Cool. That's too fun! I never know what I'll find over here...looks as if Bob is playing on a box, but I'll take your word for it. ☺ Learn something new all the time. Thanks for stopping by today..."being present" is one of my favorite topics of conversation. I'm assuming the name of the band is Two Car Pileup?? Your blog post title scared me a bit. I was worried someone close to you was involved in a car accident. How exciting that he's doing something he enjoys! Sounds like lots of fun, Terri! Just think, now you'll be a groupie!!! Oh, You are living my not so secret dream. Only in my dream I am singing.